Purple Perigord, named for the grapes of the region, is to the south-west of the Dordogne and centred around Bergerac. Bergerac is also the most common arrival point for visitors to the region, since the opening of Bergerac airport. The region follows the lower stretch of the Dordogne River, as it becomes wider and slower moving after passing Lalinde. This stretch of the river is extremely popular for canoing, boat trips and relaxing on the river beaches that dot the river edges. Many well known wines are produced in the Bergerac region. See Bergerac wines. The countryside in the region is one of rolling hills, fields of sunflowers, and ancient farms set in attractive countryside, in addition to the many vineyards in the region. The Perigord Pourpre is probably the second most popular part of the Perigord region after Perigord Noir. 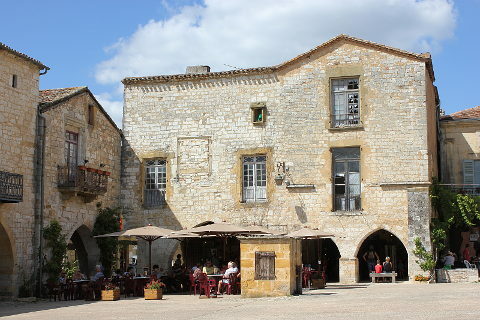 It is home to a number of Bastides towns and Medieval villages as well as the "most beautiful village" of Monpazier. The bastide villages of Eymet and Beaumont-du-Perigord are both very attractive villages well worth a visit. Molieres is another bastide village to the east of Beaumont and to the south of these is the bastide village of Villefranche-du-Perigord, a quiet bastide set in attractive countryside. A delightful medieval village which has the air of not having changed for centuries is Issigeac and this village has a particularly good market every Sunday morning. Bergerac is the biggest town in the Perigord Pourpre and its medieval old town is delightful. It also has an excellent selection of shops and bars and restaurants. The town of Lalinde is a little east of Bergerac on the edge of the river Dordogne. Further east of Lalinde the river Dordogne sweeps round a big loop and at the Cingle de Tremolat you can get great views of this huge loop in the river. The village of Tremolat is small but delightful. The river then sweeps into another loop as it approaches Limeuil which is another of Dordogne's "most beautiful villages" and is also the point where the Dordogne river meets the Vezere river. North of the river Dordogne but still in the Perigord Pourpre region is the busy small town of Mussidan and nearby Neuvic with its attractive chateau. Of particular historic interest are the abbey and cloisters at Cadouin and the beautiful chateau of Monbazillac where you can sample the famous Monbazillac wine. The abbey and village of St-Avit-Senieur, between Beaumont and Cadouin, is also worth a visit. The castle of Saint-Michel-de-Montaigne and the nearby archaeological site at Montcaret where you can visit the ruins of a Gallo-roman villa. Outside the Dordogne department but certain to be on your agenda if you are in this region is the stunning UNESCO listed town (and world renowned Bordeaux wine producing region) at St Emilion. For the other parts of the Perigord see: Perigord Noir, Perigord Vert and Perigord Blanc.